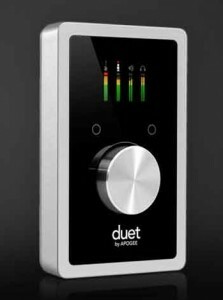 Apogee Electronics has introduced the Duet 2 – the next generation of their Duet recording interface. Duet 2 features balanced outputs, independent speaker and headphone outputs, configurable touch pads and improved sound quality. Duet 2 can record from sampling rates of 44.1 to 192kHz. The Apogee Duet 2 is priced at US $595 and is expected to be available in April.